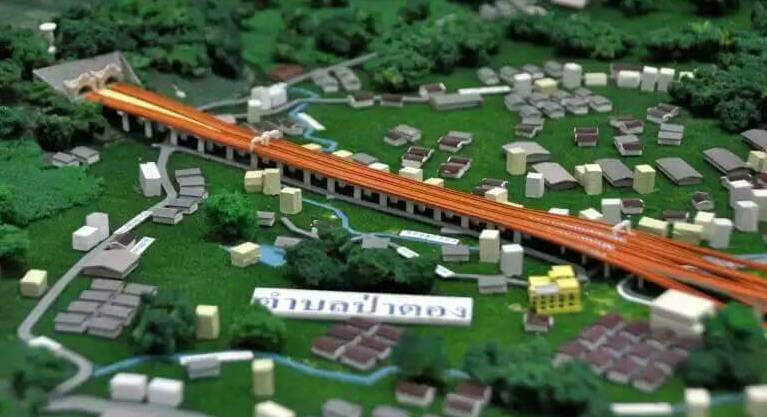 PHUKET: Construction of the long-awaited B6-billion Kathu-Patong tunnel could well begin as early as next year if the Environmental Impact Assessment (EIA) gets approval, according to Aiyanat Tinapai, Governor of the Expressway Authority of Thailand (EXAT). Mr Aiyanat held a Tunnel Construction Technology seminar with West Nippon Expressway Engineering Chugoku Co Ltd (Nexco) as well as other consulting companies and engineers for the project at the EXAT headquarters on August 11 to discuss the conclusion to the studies carried out for the tunnel. “The studies and design for the project have been concluded, and if the EIA study is approved we will move forward with our proposal for the tunnel,” said Mr Aiyanat. “Should this get the go-ahead, construction will begin around mid-2016 and the project will be complete within five years. “Once the Kathu-Patong tunnel is open to the public it will certainly help to reduce traffic on Highway 4029,” he said. The Kathu-Patong tunnel project will be overseen by EXAT and it will the first tunnel to be built in Phuket. EXAT first proposed the tunnel idea in 2011 and since then have been working to find the best operational ideas for the tunnel and learning new and different construction techniques. “Nexco is a Japanese company that specialises in constructing expressways and tunnels and has provided us with new knowledge and ideas. They have also shared their experiences with our engineers and other departments involved in the project,” Mr Aiyanat said. “Nexco engineers have emphasised that safety during construction of the tunnel is their priority. However, high-tech devices such as sensor systems to monitor the movement of the tunnel, smoke detectors and other devices to help monitor traffic flow inside the tunnel will be installed once construction is complete. “These devices will set off an emergency signal to a control centre if any problems are detected inside of the tunnel,” he added. A representative from Nexco said that when choosing the construction company that will be in charge of the project, expertise in road and tunnel construction is a must, Mr Aiyanat assured. “The company must be highly responsible and have a lot of experience. This type of project is risky and likely to have unforeseen incidents, so all works require supervision, should follow risk management guidelines and work discreetly,” he said. Nexco uses new technology to build curved, instead of straight, tunnels, Mr Aiyanat explained. Mr Aiyanat explained that the Kathu-Patong project will use a raised expressway with a total length of 3.98 kilometres. “The expressway will have four lanes that will start at Phra Meita Rd (off Pang Muang Sai Kor Rd) in Patong. Two lanes will be for cars and two for motorbikes,” he said. “The expressway will rise above Pisitgoranee Rd to Patong Hill (900 metres) to the tunnel and through the hill (1.85km). “It has been decided to use two tunnels with the raised carriageway design as this will also reduce traffic in the area and provide convenience to users. “Toll stations will be located at the end of the raised carriageway in Kathu, where it will join Route 4029,” he added. For more details of the Patong Tunnel project, click here and here. They said they wouldn't build overpasses at Chalong and bypass road because they figured they wouldn't look nice. What about this? Same thing. Who cares as long as it works. They could have saved tons of money and much less time to build.